A fiercely independent divorce lawyer learns the power of family and connection when she receives a cryptic message from her estranged mother in this bittersweet, witty novel from the nationally bestselling author of Someone Else’s Love Story and gods in Alabama—an emotionally resonant tale about the endurance of love and the power of stories to shape and transform our lives. Born in Alabama, Paula Vauss spent the first decade of her life on the road with her free-spirited young mother, Kai, an itinerant storyteller who blended Hindu mythology with southern oral tradition to re-invent their history as they roved. But everything, including Paula’s birth name Kali Jai, changed when she told a story of her own—one that landed Kai in prison and Paula in foster care. Separated, each holding secrets of her own, the intense bond they once shared was fractured. Then Kai’s most treasured secret literally lands on Paula’s doorstep, throwing her life into chaos and transforming her from only child to older sister. Desperate to find her mother before it’s too late, Paula sets off on a journey of discovery that will take her back to the past and into the deepest recesses of her heart. With the help of her ex-lover Birdwine, an intrepid and emotionally volatile private eye who still carries a torch for her, this brilliant woman, an expert at wrecking families, now has to figure out how to put one back together—her own. The Opposite of Everyone is a story about story itself, how the tales we tell connect us, break us, and define us, and how the endings and beginnings we choose can destroy us . . . and make us whole. Laced with sharp humor and poignant insight, it is beloved New York Times bestselling author Joshilyn Jackson at her very best. 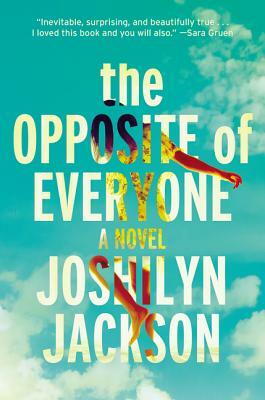 Joshilyn Jackson is the New York Times bestselling author of seven novels, including gods in Alabama and A Grown-Up Kind of Pretty. Her books have been translated into a dozen languages. A former actor, Jackson is also an award-winning audiobook narrator. She lives in Decatur, Georgia, with her husband and their two children.